I was planning to make naan for a long time now. It remained just a plan for a long time for some reason or other. Finally V gave enough push to actually try my hands on it. He usually does not like this very popular bread. But one of his colleagues is a great fan of garlic naan and V wants to invite him home sometime. I didn’t want to experiment on him, so I had to learn making these at home. My first attempt was not very good. Though everything was fine, I rolled them a bit thicker than required for naan. When baked, they became like a thin crusted pizza base. I had also used 1 cup all purpose flour + 1/2 cup wheat flour for this. I think the wheat flour made it a bit dense. So this time, I made them real thin and I could not believe my eyes when they puffed up beautifully. Within minutes, we finished them all. I took some help from Bee’s recipe, Asha’s recipe and many more from the internet. I saw many recipes that used baking soda/powder instead of yeast, but I love working with yeast as I get fascinated when the dough doubles in volume :). The pictures don’t do justice, as we really like eating them very hot, fresh out of oven, I did not spend time clicking pictures as they get cooled off. But I tried to click some anyway. When I make them next time, I will try to take more pictures. Heat the water to luke warm (it should be warm when you dip your finger in it. I normally microwave water for 10sec). Add yeast, sugar and salt. Leave it for 10mins till the yeast forms a froth(gets activated). Now add all remaining ingredients and make it into a dough. Knead for 3-4mins. Cover with a cloth or plastic wrap and leave it in a warm place for about 2-3hrs till the dough doubles in volume. Make balls from the dough and roll them. Do not make them too thick as they puff up when baked (I roll them into thicker than chapathi/phulka but thinner than alu paratha). Apply a little butter on top. Line them on a lightly buttered cookie sheet. Bake in the oven at 425F for about 7mins till they puff up. Take out, apply the garlic-butter mixture on the top and keep it in the oven again. Bake for another 5mins till the top looks brownish. – I kept a pizza stone in the oven and then placed the cookie sheet with naans on top of it. – You can reduce the amount of butter if you don’t like too much butter. – Avoid the garlic for plain naan. – Do not apply too much butter while baking to avoid the brown color. I like the color, so I bake it with butter. 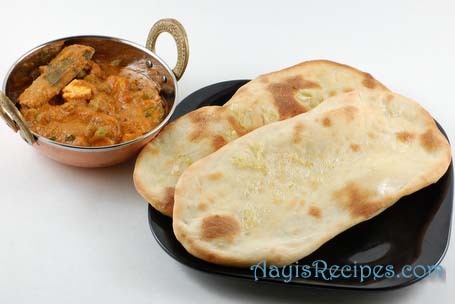 – If you do not have oven at home, roast the naans on a tava like normal chapathis. here’s something i found. forget baking. put them on a hot tava (preferably cast iron). it should be very very hot. when it starts bubbling on the top and gets golden bow spots on the bottom, put the uncooked side directly on a flame like you do for phulkas for a few seconds until you get a few charred spots. just for a very short while. the result is much much softer than baking. and it remains soft even after cooling. try it. Shilpa: Thanks Bee. Will try next time. I saw roasting them on tava on TV sometime back, i wasn’t very sure if they would work well. But yes, I have tried grilled pizza on my cast iron grill and it was awesome. So I am sure this also will be great :). Shilpa: Was the yeast very fresh(check expiry date)? Crushed the yeast – was that written on the instructions? I never crush them, just add them to water with sugar and salt. If the water is too hot, the yeast may die. If it is too cold, the yeast does not get activated. So try it again. Thanks for this! I thought naan could only be cooked in a tandoor! will try this tomorrow! Wow! I love garlic naan. Thanks for the recipe Shilpa… I somehow get scared to try things that use yeast! Oh wow, what a recipe to start my new year with. I am going to get the yeast from the store tomorrow itself and see how I fair at this one. Thanks for sharing this recipe Shilpa and thanks bee for all those tips too. toda y morning when i got up i was thinking of making malai kofta and naan for lunch today, when i came and victed ur site, u had updated the naan recepi. i thnk we both have telepathy 🙂 will do it today and let u know till now all ur recepies have come out good:) thanks to you and ppl all sayme that i am a good cook including ,y son who is 7 and daughter who is 5 . thanks to you. They look fresh to me! I too like garlic naan very much and this is my usual farmaish in hotels:) Happy New Year! Hi Shilpa!!! Happy New Year!!! “naan” is my daughters favourite food. I make it very often at my home and would like to share my technique of baking them. instead of baking them you can try to broil them on highest degree of the oven and placing the naan to the top most rack. you get beautiful brown spots on the naan in few seconds. Those really look lovely….I am still quite afraid to make them….! Happy New year to you and yours! Made them a couple of times at home. My kids love it. The first time i made it in oven, was abt 18 months ago. I was not satisfied with the results. Then my neighbour suggested to use a cast iron pan. Since then it has been perfect. Thanks Bee for the tip of cooking one side directly on flame. Thanks for the naan recipe. Is there any alternative for yeast/baking powder. Won’t it become fluffly otherwise? As even dosa batter also needs bakind soda/yeast to ferment but I prepare the batter without using them! Shilpa: I don’t know if there is a way to make naan without baking powder/yeast. Hi Shilpa,the naan luks lovely. Do u have to stir in the yeast and sugar? It may sound really stupid but my yeast never ever rises. And i dont have a microwave to try your method. Please help. Haapy New Year!Please also tell me the recipe of the curry that you have made as a side dish for the naan. It looks great! Shilpa: It is matar paneer. I will post it soon. 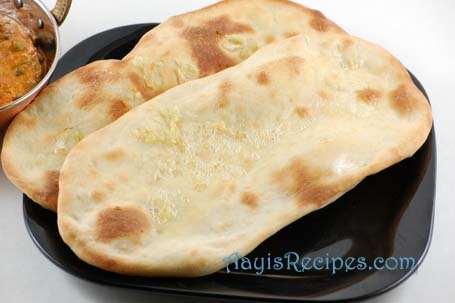 The naan luks gr8, I tried to prepare naan many times but was never successfully with yeat :(. Will hv to try again…. I also tried making naan few days back,n they came out really well.. , though i don’t have a oven ,i made it over stove top only.. And even i couldn’t click the pis.. [:)] , next time ‘ll take snap post it..
Hi Shilpa, Thanks for Naan’s recipe. Its very good in taste compare to hotel’s Naans. Thanks again. Give me some another recipe of KIDS favorite. First of all, let me wish you a very Happy New Year, Shilpa. Your naan looks fantastic, even though its not warm. I make mine at home too. The stove top versions are softer than the oven baked ones. You can even use your non-stick pan (on medium heat) to make them. Wet one side of the rolled naan and put that side face down on the pan. It will stick. Cover the pan for about 1/2 a minute and the naan will puff up. Then just hold the pan + naan upside down a little abouve the flameit will brown. Use a spatula and loosen the naan from the pan. This looks interesting. I m going to try & let u know. Tried the naan recipe ,it turned out to be a a success. I was wondering does the pizza stone enhances the outcome? And if I have to buy one which shop/brand I should look for in U.S.? Shilpa: I bought it in Walmart. Don’t know the brand. can we do the same receip in the convientional oven …. pl let me know…..
i tried this receipe, except that instead of an owen, i used Convection setting in the Micro. the 1st batch turned hard like pappad. So i then took a blob of dough, cut it in 2 halves filled the garlic butter in the center, then put some more on top. i tosees it back in the micro for 30 mins. The result was a loaf of yummy garlic break, the a crisp outer layer. Just like the kind served in pizzerias in Bangalore. Your Naan looks perfect!!! One way of making naan without using baking powder or yeast is to use self raising flour instead of all purpose flour / plain flour. Self raising flour is also used while making bature.. which gives them same result..
Doesn’t adding salt to the yeast+sugar mixture kill the yeast ? Or should we add the salt to the flour instead? Shilpa: Jane, I don’t know. I always make bread also this way. Shilpa – Really appreciate your quick response..Followed your recipe , however did not bake it..Used the stove top method..sticking one side and inverting the tawa..Was great.Thank you ! Recipe turned out awesome but am not satisfied with the thickness I rolled it out.. May be next time you post a pic of how thick you rolled them (I know you have been elaborate in your explaination but I still goofed up). Can i freeze this naan? … if i have to make it for guests, its not poassible to make them after they have arrived like other roti and parathas..
Shilpa: I haven’t tried freezing them. But you can give it a try. u can add a 1 tsp of baking powder along with the amount of yeast u r using, this will help in cooking naan faster..it actually takes only 3-5 mins for the naan to get cooked with baking powder. Do you have a recipe for Kulchas? Can we store any leftover dough in fridge for later use. ooh la la… looks tremendous! drooling me is ready to get into the kitchen & try this out right away! thanks Shilpa!!! Can u pls let me know which brand is it from? Can u pls let me which brand of yeast u r using from market? can i use instant yeast for this& same way as u do with active dry yeast. plz let me know. Tried out the naan today. But I used baking powder instead of yeast. The dough did not double n it puffed only at the edges not in the centre. I used tava method. Can you tell me why this happened? But I liked the taste very much. Sorry Ciana, I have no idea. pleasssse do reply.i am waiting……………..
Sambhrama, All purpose flour is similar to Maida. You can use maida if it is available to you. wenever I do muffins the upper layer vl be litle golden brown n hard but it vil be sponge inside, n all sides , underneath, d colour vl be white. please say y it happens. I would suggest reducing the temperature next time and baking for longer time. I think the temperature is too high, so outside is getting baked fast and inside is not completely baked. k……. thank you…., next time wen I bake I let you know the result.i tried your masalapuri it came best …., take care..
All Purpose flour IS wheat flour. In fact, if it is not specifically marked another flour such as “rice” flour or “rye” flour or “potato” flour, then the flour is wheat flour. That goes for all purpose flour, pastry flour, self-rising flour – it is ALL wheat flour. Even whole wheat flour is made from wheat but, the whole grain as opposed to it being stripped down/refined.